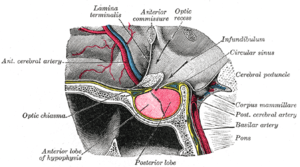 The hypophyseal portal system is a system of blood vessels in the brain that connects the hypothalamus with the anterior pituitary. Its main function is the transport and exchange of hormones to allow a fast communication between both glands. The fenestrated structure of capillaries in the hypophyseal portal system facilitates a rapid exchange between the hypothalamus and the pituitary, with only a small amount of hormones needed to stimulate an accurate effect in the respective target organs in the body. Peptides released near the median eminence from hypothalamic nuclei are transported to the anterior pituitary, where they apply their effects. Branches from the internal carotid artery provide the blood supply to the pituitary. The superior hypophyseal arteries form the primary capillary plexus that supplies blood to the median eminence. From this capillary system, the blood is drained in hypophyseal portal veins into the secondary plexus. The peptides released at the median eminence enter the primary plexus capillaries. From there, they are transported to the anterior pituitary via hypophyseal portal veins to the secondary plexus. The secondary plexus is a network of fenestrated sinusoid capillaries that provide blood to the anterior pituitary. The cells of the anterior pituitary express specific G protein-coupled receptors that bind to the neuropeptides, activating intracellular second messenger cascades that produce the release of anterior pituitary hormones. The blood supply and direction of flow in the hypophyseal portal system has been studied over several years on human cadaver specimens with injection methods. Results of these studies have shown that the neural hypophyseal stalk receives arterial blood from ascending and descending infundibular branches, coming from the arteries of the superior hypophyseal arterial system. Small ascending vessels arising from the anastomoses that connect the upper with the lower hypophyseal arterial system also supply blood to hypophyseal vessels. The majority of these branches penetrate into the neural tissue to break up into capillaries for rapid hormone exchange. Over- or under-function as well as insufficiencies of the hypothalamus or the pituitary gland can cause a negative effect on the ability of the hypophyseal portal system to exchange hormones between both structures rapidly. This can have major effects on the respective target glands, making it impossible for them to carry out their functions properly. Occlusions and other issues in the blood vessels of the hypophysial portal system can also cause complications in the exchange of hormones between the hypothalamus and the pituitary gland. 1 2 Molina, Patricia.E. (2010). Endocrine Physiology. Lange. (3, p. 31). ISBN 978-0-07-161301-9.